This quick and tasty treat is wonderful all year round. It can be easily prepared in less than 10 minutes. Be sure you have all your side dishes ready before you start to cook. 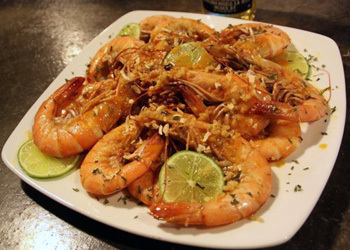 This recipe originated in the sea port of Veracruz, Mexico where many Spanish imports began their reincarnation into the indigenous culinary traditions. In a sauce pan, add butter, garlic and olive oil sauté at low heat for 1 to 2 minutes. Set aside. Should be yellow and clear in color. Rinse and butterfly cut each shrimp leaving tail intact. Towel dry. Use a heavy frying pan for best results. Place pan on stove at high heat. Pour butter sauce and shrimp into pan. Lower heat immediately to medium. Sauté shrimp 1 to 2 minutes or until pink in color. Sprinkle with salt to taste. Do not over cook. Garnish with Lime and Lemon slices and Cilantro sprigs. Best served immediately. Save left over butter sauce for dunking or drizzle on shrimp. Serve with grilled vegetables, tossed green salad, guacamole, spicy hot sauce and Corn or Flour tortillas.